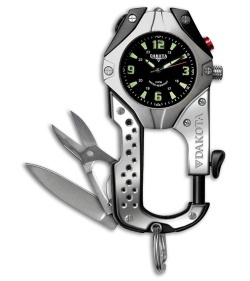 The Dakota Knife Clip Watch is perfect when your pockets are full you can clip this on a key ring or belt loop to free up space and have a tool that has it all. This is packaged in a transparent H2O water resistant box. Silver and black finish aluminum casing. Black face and luminous hand and markers. Stainless steel knife blade and scissors. Attachment clip and key ring.